Are you maximizing the potential of your blog? Here are nine decisions I made about the new site that you can use to improve your own blog. No question that blog publishing is a do-it-yourselfers paradise. Especially with WordPress, only a modicum of technical competency is enough to set up and run a credible blog. However, if your blog is integral to your business I suggest working with people that specialize in blog design and development. I’m working with Unique Blog Designs, whose designs for Ted Murphy, Shoemoney and others I liked a lot. It probably doesn’t matter (since I’ve never met them personally), but it’s a bonus that they are in Scottsdale, so a face-to-face would be easy to arrange, if needed. For blog maintenance and technical issues, I work with Chuck Reynolds in Phoenix. He is a patient ninja who knows all things blog and SEO. While it’s true that a blog is a reflection of your thoughts and personality, it’s also true that blogs are inherently copy heavy. It’s about reading. Thus, I am striving for a very clean design. Hat tip here to Amber Naslund’s blog, which I find to be extremely easy to read, and whose font style I’m borrowing from liberally in this new version. Based on my experience with hundreds of Web site design and usability projects, I’m a big believer in giving the visitor’s eye a limited number of distinct places to rest. This helps with scanability, and is why I am moving to boxed elements on the right hand side of the blog. Each are their own “chapter” conveying different information in a self-contained visual unit. Subscribers are the life blood of a blog. They receive every post you write via email or RSS feed automatically. Thus, making it convenient for them to subscribe is clearly a best practice. I have cleaned up my previous subscription interface considerably. Inspiration from Chris Brogan, who has a similar, compact subscription component on his popular blog. This is perhaps the largest change in the new version. When I started Convince & Convert, the intention was to make it a company, thus the emphasis on the C&C brand and the lack of any mention of me on the main blog page. I have since determined that (for now) I’m going to keep Convince & Convert just me. Consequently, based on advice from the fantastic Mack Collier (see interview with Mack here), I am including my photo and short bio on every page of the new site. (photo is by Tyson Crosbie, one of the most social media savvy photographers on the planet). I do a lot of conference speaking. I’m addicted to microphones like Pacman Jones is addicted to strip clubs. But, I’m not a huge fan of blogs that plaster large graphics of each conference attended in the right column. Too distracting visually. So, I’ve added dates where I’m speaking, with links to conference Web sites. I’m also adding a short video clip, so conference organizers can get a sample of my magnetic, swoon-inducing oratory. Perhaps – like me – you struggle with the many ways to organize content previously published on your blog. Tag cloud. Categories. Archives by date. Recent posts. Most popular posts. etc. etc. etc. Each of these adds clutter to your blog. To clean it up, I’m using a tabbed interface that enables readers to sort posts by category, recency, and popularity – what I believe to be the three most relevant sort mechanisms. I am remiss for not having added this earlier, but I’m absolving my sins in this redesign. I’ll be adding some sort of registered visitor recognition tool (perhaps MyBlogLog) to provide a greater sense of community. Without comments, blogging is a pretty lonely enterprise. Lively debate is what it’s all about, and I want to increase comments on this next version. To do so, I’m writing more “unfinished” posts per Chris Brogan’s instruction. This is a bit unnatural for me, as I’ve been a magazine columnist and essayist for many years. The notion of not drawing a firm conclusion is strange, but I have found that indeed that type of open-ended post does tend to draw more comments. The second improvement is to make the comments link more prominent. Currently, it’s hidden at the bottom of the post with the sharing and related posts stuff. I feel it gets lost somewhat, so I’m making the comments link obvious and including it on both the top and bottom of all posts. The footer of most Web sites is simply a copyright notice and link to a site map. 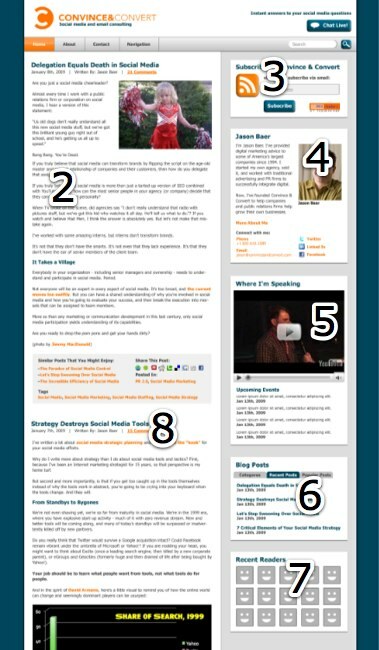 Based on their design for Ted Murphy, the guys at Unique Blog Designs encouraged me to make use of the footer space to replicate recent and popular posts, and to insert my Twitter stream. I love this idea. It turns an afterthought into a useful way to get additional content. The new Convince & Convert launches in February. What blog optimization tips can you add in the comments?